A stainless steel, insulated, leakproof Thermo Pot. 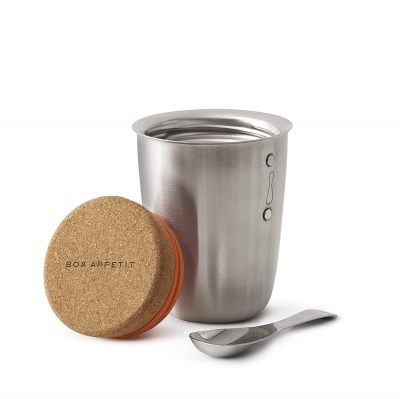 This flask comes with a handy stainless steel spoon perfect for scooping out food and held securely on the side with strong magnets. 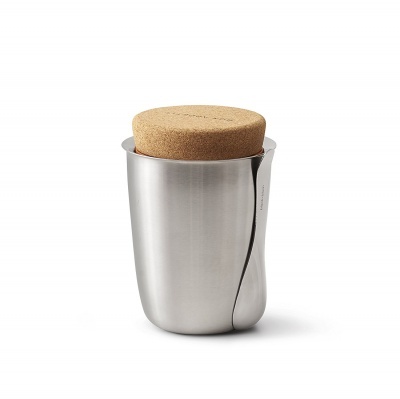 Easy grip cork insulated leakproof lid that stops heat escaping from the top. A stainless steel, insulated, leakproof Thermo Pot. 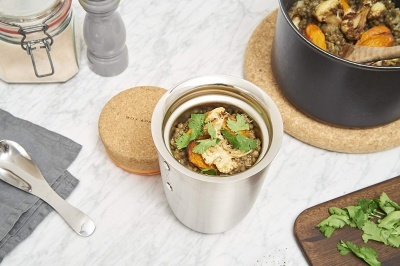 This food thermos flask is perfect for takeaway soup, hot porridge or casserole. Enjoy your lunch on the go fuss-free. This flask comes with a handy stainless steel spoon perfect for scooping out food and held securely on the side with strong magnets. Easy grip cork insulated leakproof lid that stops heat escaping from the top. W 12.5cm H17cm / W 4.9" H 6.7"
500 ml / 17 fl oz 10 year guarantee on the vacuum. For best results, before use, pre-fill for about 3 minutes, using hot water for hot food or cold water for chilled food (DO NOT overfill your flask). Leave sufficient space in the neck to fit the lid. The top of Thermo-pot is larger than most liquid flasks, therefore you should heat your food to the maximum temperature possible in order to have optimal heat retention. The lid must be hand-tightened but without extra force as the extreme temperatures will make it more difficult to open your food flask. Before screwing down the lid, please make sure that the sealing ring is undamaged and fully fits into its pocket. Clean this Thermo Pot with warm water and washing-up liquid prior to initial use and after every use. DO NOT immerse in water. Dry thoroughly after leaving it to drain. Always store vessel with lid removed. Not dishwasher safe. Clean with hot soapy water.